I am so sorry. I am so sorry to bring you a post that is so sinfully easy and delicious, and that goes against all my better judgements. I’m talking about a chocolate chip cookie. A single, gooey, hot chocolate chip cookie. But this cookie is “baked” in the microwave. In a little glass mug. It’s easy, it’s yummy and it satisfies. However, it basically stands for everything I’m against. I’m all for slaving away in the kitchen all day, baking cookies and cake from scratch and watching them bake in the oven, batch after batch. You know, the traditional way. Then this microwave cake fad happened. Appalling. But, I tried some, a few different recipes, and they were all… disgusting. No, I didn’t over-“bake” them. They were just wrong. Microwaves cakes? I hate them. Recently you may have seen a new recipe (Look Who’s Cooking Too) that claims a chocolate chip cookie can be “baked” in the microwave. I discovered it on FoodGawker, where it remained at the number one most popular recipe for days and days (and will still probably be there by the time you read this). With over 15,000 views and over 1,300 favorites, this simple little recipe became too much for me to handle. It was looking at me every day when I checked FoodGawker; I tried to ignore it for so long. I even noticed that the original recipe at No. 2 Pencil had a 4.7-star rating from 18 different reviewers. Well. Finally, I gave in. I decided to just try it. Out of curiosity alone. I probably wouldn’t like it. Um. I accidentally liked it. Oops. I can’t even begin to explain how embarrassed I was. But wow. It was truly gooey. It tasted like a real chocolate chip cookie fresh from the oven. And when a scoop of ice cream is melted on top? I probably shouldn’t even go there. Unfortunately, however, I did. I’ve made this naughty little cookie a few times now. One time, I added 1/2 tablespoon of peanut butter and melted it along with the butter, which was nice. And another time, I added about 1/2 tablespoon of Greek yoghurt along with the egg yolk, which was also nice (but required a little bit more flour). I even tried replacing the butter with coconut oil once, but I didn’t like the final texture. I made one of these cookies on a Sunday morning once. That was terrible of me. And I made one late at night. That was probably even more terrible. That’s exactly how sinfully tempting this recipe is. I’m so sorry to be posting about this; this recipe should be forbidden. And again, I’m so sorry to be posting a recipe for something I’m embarrassed about. For something I said I’d never do again – making food that should be baked in the oven, in the microwave. For something that can seriously alter a person’s life. Be warned that with the knowledge of this recipe, you will need to have, or quickly develop, the skills to just say no. No, I don’t need to make a cookie in a microwave. Okay. 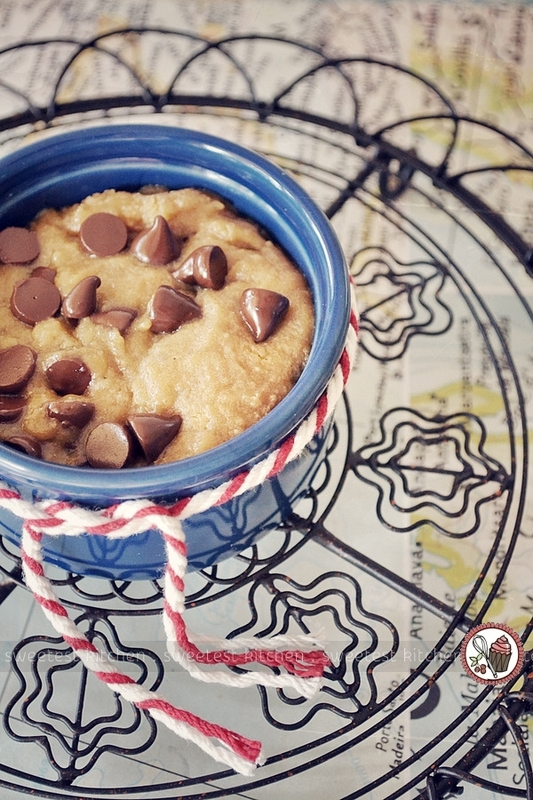 So you do actually want to try making a chocolate chip cookie in your microwave? I’m really sorry. The recipe is below this glass of milk, which you’ll also need for washing down this sinful atrocity. Now, don’t say I didn’t warn you. 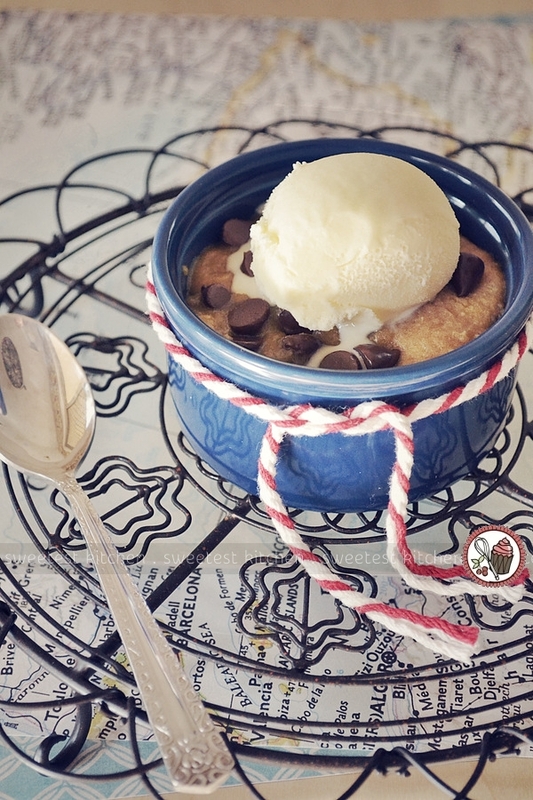 A simple, single-serving, gooey chocolate chip cookie that can be prepared and cooked in your microwave within minutes. Choose a microwave-safe mug/ramekin/small bowl. It doesn't have to be large, as the cookie doesn't rise like microwave cakes do, if at all. Place the butter in the mug and melt in the microwave; do this in 15 second intervals at about 70% power (it should be melted, not boiling). When you have small bits of butter remaining, take it out of the microwave and gently swirl, or stir, the butter until the bits have melted. To the melted butter, add sugars, vanilla and salt. Stir well. Add the flour, and stir until combined. The consistency of the dough should be similar to real cookie dough; if it's too runny, add a touch more flour until the consistency is firmer, or if it's too stiff, add a splash of milk. Microwave at about 70% power for 30-40 seconds. Do not overcook. For your first time, only cook for 30 seconds; if it's still looking quite wet on top, microwave at 70% power for another 10 seconds. The cookie will continue to cook once it's removed from the microwave, and it will be very hot. If you overcook it, it will be become dry and hard, so always err on the side of less cooking time. The recipe's "cook time" does say 1 minute, even though cooking time is actually less than 1 minute, so disregard that. The recipe plugin I use doesn't let me do the cook time in seconds; it'll only let me use minutes! Uh Oh, I might have to try this! Does anyone know how much calories are in this?? I calculated it to be around 528 calories. The original recipe is closer to 413 calories, not 528. I made a modified one that came out to around 327, too. The original tastes a little better, but if you’re making microwave cookies it doesn’t make too much of a difference. Also, the whole recipe comes out to the size of roughly 4 regular sized cookies. “1 serving” is pushing it a bit if you’re trying to act like this is the same as a single cookie. I also tried this recipe with pumpkin chocolate chips leftover from the holidays. Pretty good! Nothing compares to real cookies though. Cayla, the recipe states to microwave at 70% power for 30-40 seconds, not 2 minutes. You should have read the instructions. I put it in for 1 minute and it was ok with a burnt outside. Wait? You hate a recipe because you didn’t follow the directions? Well… You are supposed to do it for 30 SECONDS FIRST!!!!! I wish I could say this was a positive experience but unfortunately, not so. The cookie rose and well it was more of a muffin which may be my fault hence the 3 stars but i still expected it to be crisp from the outside while chewy and soft from the inside. I didn’t get it. Dissapointing. Ended up like a muffin and quite spongy, I don’t know what I did wrong. The only thing different is that instead of chocolate chips I used chocolate melts. I do not think that made a big difference. But it still tasted super good. It is quick and doesn’t require much effort or ingredients. If you have any more microwavable quick recipes like this please share them to everyone because nothing I have ever made was so EASY! it didn’t work to well for me…. I used a whole egg cause my mom said it’d be a waste otherwise. Heh heh…… it was too runny. THAN i added all the dry ingredients a pinch more. I didn’t add enough coco chips *whoops*. It wasn’t sweet enough. But thats what u get when ur 11 I guess. But great recipe and I’ll be sure to try again! =) And please use clean language Chealsea! Thank you! I was wondering what would happen if I used the whole egg instead of just the egg yolk. I’ll be shopping today & I shall post once I make this delicious sounding & looking chocolate chip cookie. Yum-o! This was amazing! Thank you for being so specific with your cooking instructions, it turned out perfectly! They look and sound delicious. I have everything but the caster sugar. Looks like I’ll be headed to the store shortly. Can you use this with pre-made store bought cookie doe? Hi Dawn, I’m really not sure, but personally, I wouldn’t. For pre-made store-bought cookie dough I’d recommend you follow the instructions on the package. Some actually say not to microwave it. Hahaha! It sounds delicious! How much cocoa powder did you add? Did you take out any of the flour to make up for the addition of the cocoa powder? I done it with cooking chocolate, cut up… Divine! I did this and loved it! Great idea, great recipe! Thank you! You must have missed something. I followed this to a tee and it was amazing! Two possibilities…you didn’t follow the directions, or you’re a troll just posting to be divisive. The recipe works, tastes great and you need to go away. I tried to give 5 stars but only 2 will “click”. Oh my gosh, I hate/love you for posting this, it is TOO good! I was dying for some sweets last night and made this. I have a feeling this might be my new go-to breakfast, lunch, and dinner recipe. YUMMMMMO! I didn’t have the exact ingredients listed above but it was still amazing. I only used: 1 tblsp butter, 1tblsp light brown sugar, 1tblsp granulated sugar, pinch of salt, 3-4tblsp flour, 1 egg yolk, handful of choco chips. My microwave cooked it in about 30-35 seconds. It tasted better than “real” choco chip cookies baked in the oven. 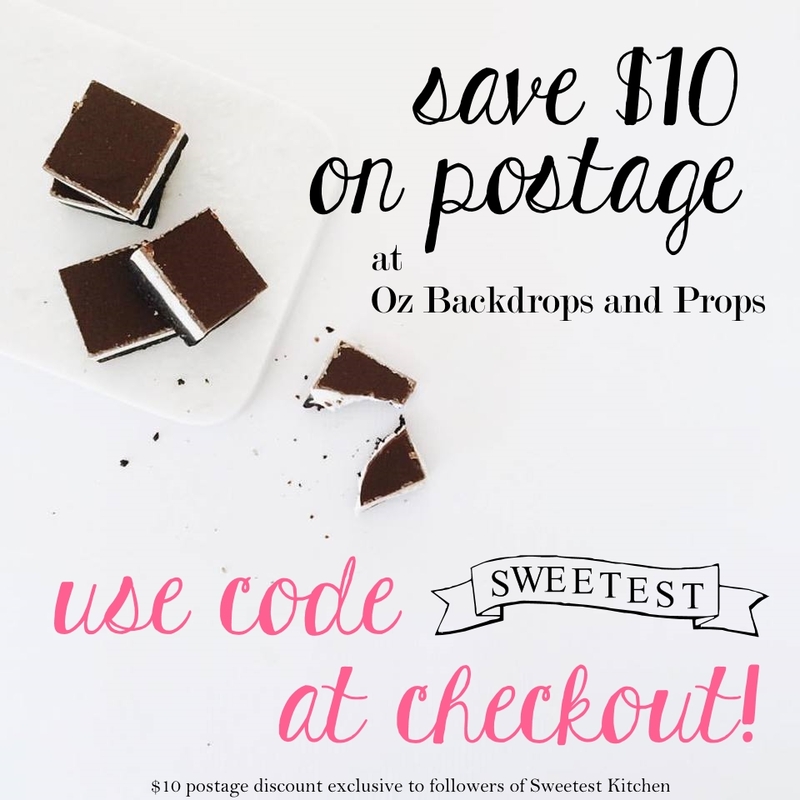 You have taken care of some major chocolate cravings!! Making this tonight, thanks so much! Made it exactly the way you said. Loved it. Did not share it with my husband. I made this and it turned out great! Put it up on my blog too 🙂 Thanks for sharing! Use normal butter.. Works well too! Hi Shana, I have no idea why your microwave cookie would rise! You didn’t use self-raising flour by mistake, did you? That’s the only reason I can think of! Yummy! I made this cookie with the egg yolk on day 1. I saved the egg white (covered) in the refrigerator overnight. On day 2, I made the cookie with the egg white. It was just as yummy. Thanks for the recipe. I reading through the comments, wondering if that would work! Awesome! This was delicious. I’ve been nervous about trying anything made in the microwave, but this was wonderful! I thought this recipe was pretty good for a microwave recipe but my cookie had somewhat of a cakey texture. I was kinda looking for that buttery gooey texture with a little crunch at the end. But all in all it was pretty good. I think I might try other recipes before I come back to this one. This was just ok, the taste of a choc chip cookie is there but the texture was so odd and nothing like a cookie; it was more like a dense muffin. So if you wanted to make these in the oven, in a ramekin, how hot and how long do you think? Why can’t you use the whole egg, and add more flour to compensate? I have a broken oven and wanted to try a cookie in the microwave. I’m about to try it. Maybe i should make two right away. I didn’t have any egg, so I sub’d one tablespoon of olive oil for the egg yolk. I got everything ready and then realized…my sister in law stole my flour! And to top it off, all I had was self-rising flour. Since I had already added the other inredients (OOPS!) I said “screw it” and made it with the self-rising. The texture wasn’t particularly cookie-esque, but it was still delicious! Jamieanne, just tried this a few minutes ago and IT WAS DELICIOUS! Don’t let the detractors get to you; microwave recipes must not be to their liking 🙁 Fast and yummy, what’s there not to like? My only complaint is that the finished cookie only quarter-filled my cup. MORE! Just made this with 5 tbsp almond flour for 45 secs. DELICIOUS! ……..GREEN COOKIES NEVER TASTED SO GOOD. Oh my god, other recipies taste like pancakes, you know? BUT NO. THIS WAS HEAVEN IN A CUP. I DON’T KNOW HOW TO FUNCTION ANYMORE. !!!!!!!!!!!!!!!!! Hello, thank you for this recipe, I was really excited to try it but when I did it came out like a cake, not so much raised but just cakey. I was wondering maybe it’s because of the paste? Is it meant to be a dough or a thick paste? My cookies are always prepared as a thick batter because that how they always turn out but they come out ok in the oven. What can I do to make it come out like a cookie in the microwave? I loved this recipe because it was so easy and quick. The dough did rise a bit inn the microwave and it had a cakey texture but it still tasted great!! I’ve become really wary of microwave cake/cookie recipes due to the fact that.. I’ve failed miserably 99% of the time with each. They all ended up being extremely dense and unpleasant, but as a last ditch effort to find something that actually works and tastes good, I found this. It’s amazing.. It’s soft and yummy and, I replaced the chocolate chips with a big spoonful of peanutbutter and the caster sugar with normal white sugar and it came out great. I did this and tasted fabulous!! really really liked it, I added the hole egg, and not only the yolk, but it turned out good tho. added some strawberry jam and was just perfection, thanks! This looks incredible! I have to make this ASAP!!! I made this and it’s pretty good, but I’m going to use just 1 tbsp of chocolate chips next time. Don’t get me wrong, I am a chocoholic, but the bottom of this was just melted chocolate. It overwhelmed the cookie. It was also too sweet, so next time I think I’ll also cut out the caster sugar and just make it with 1 tbsp of brown sugar. I don’t know what people are talking about… this recipe comes out great for me every time! My hubby and i love these for a quick chocolate fix! With a glass of milk, it’s the best! It’s obviously not going to be exactly like a cookie from the oven, but this is pretty darn close, and so yummy for the short amount of time it takes. Thank you for posting! This……was…….awesome!!!!!! Thank you for sharing!!!!!! Thx for the recipe. I read it wrong and added the egg white instead of yolk. It was still delicious! It fulfilled my craving for something sweet and kept me to one serving (if I’d made cookies I would have had way too many). I’m going to check the calorie count on this one for sure. Thanks again! I tried it just now and it’s so delicious, not messy and quick I know I won’t be able to resist often. It came out perfect and gooey. Now I will want one everyday! I’ve always liked microwave cakes but last night I got sick of the same thing all the time and came across this. I think I’ve fallen in love…. Hi and thank you sooo much for this my family is addicted!!!!!! I have a very omportant question. One of my cousins is vegan…. is there any way i could try to replace the egg yolk?? or even bake it without?? Thank you so much again… and again!!!! I didn’t have any eggs, so I substituted the egg yolk with a pinch of baking powder and about a teaspoon and a bit of rice bran oil. It was delicious! I’m vegan and I substituted a tablespoon of vegan yogurt. THIS WAS SO DAMN GOOD AND IT TOOK LIKE 5 min TO MAKE. I AM HOOKED. MY LIFE IS NOW WHOLE. Okay so this was truly amazing. I just want to add that all I had was brown sugar on hand and it turned out absolutely beautiful and scrumptious. 5 stars!!!!!! Just made this and it was FANTASTIC! I am watching my sugar so I subbed sucralose for the sugars. It was still to die for!!! I actually didn’t use vanilla because I didn’t have any and it tastes like heaven in my mouth!! I hadn’t found a microwave recipe that I liked until I found this one. It’s a little cakey, but really good! And yes, it’s sweet. It’s a cookie! My only question, can the recipe be doubled?! Wow. Just put this recipe together and it really did the trick. Next time I’d like to see if it will turn out more gooey or cakey. This one got eaten as cookie dough. Lol 😉 Thank you so much for this recipe. So delicious!!!!! This was so amazing and so easy. Thank goodness it is only for one cup because it would be extremely dangerous at bigger servings. Definitely satiated my sweet tooth! Will definitely make again. It was so awesome. I am still in shock at how wonderful this was and I love that I don’t have to make a huge batch of something for my sweet tooth. it was really yummy and we will definitely be doing it again! Hi Hali, I’m sure that would be fine. It might taste nice cold, I’m not sure, but you can just give it a quick blast in the microwave to warm it up again. Best mug cookie I’ve come across! Thanks so much! Ps- it won’t let me rate the recipe, but I give it 5 stars! Started googling and came across this recipe. While it didn’t have the crunchy outer, gooey inner I love in an oven baked cookie, it only took a minute to make and well worth me not having to stand for hours in a kitchen! I have no eggs, would olive oil be okay as a substitute? I came across this recipe tonight and just HAD to have it. However, when I went to my kitchen to check out what I had, I discovered that I didn’t have eggs, I didn’t have caster sugar, three bags of light brown sugar, but no dark brown sugar, and imitation vanilla, but no pure vanilla. What I’m trying to say is that you can play around with this recipe and still manage to get something extremely delicious! I used what I have – substituting vegetable oil and almond milk for the egg – and made two delicious treats for my roommate and I to devour tonight. Great recipe! Definitely some room to play! I hated this. I followed it exactly and it turned out cakey and not at all good. It actually made my sweet tooth run and hide. I’ve juste made this and… oh god, i’m in cookie heaven right now. It didn’t came out crunchy as i expected but instead a little cakey and mushy, but i was cool with that. I combined it with milk and OH MY GOD. Omg!! This is the best I’ve ever tasted!! ……And I’ve tried……A LOT of recipes! Most cakes and cookies made in a microwave often comes out like a sponge and doesen’t even taste good. But this one…….. OMG, this is the best recipe I’ve EVER seen! It’s like heaven in a cup…. + I never need to waste my calories on a cake that doesen’t even taste even taste any good! But the thing is…. I’m on a diet. And I feel really bad about eating this cookie! So does anyone know how much calories it is in this recipe? I was so excited I read the ingredients threw them all in at once and then read the instructions, oops! It still was super yummy but can’t wait to try when I actually melt the butter first and mix everything well! Thanks for sharing! Omg amazing. Thank you so much. It wasnt that great. It took wayyyy longer than you said to cook and it still taste doughy…may be because i used egg replacer. I tried this a few times. While it was ok, the chocolate chips always sink into a glob and the cookie was more like a giant cake with a chocolate bottom. That didn’t happen with me! Maybe it needed more flour? I just made this to test out as a dessert for my kids. Only problem was that I didn’t have any eggs in the house. I substituted 1TBS of mayo instead and it turned out lovely. Although not as good as your typical chocolate chip cookie, it’s definitely good if you aren’t in the mood to make a whole batch! I doubled this and put it in a large ramikin for my husband and I to split. I substituted a gluten free flour blend for the regular flour and had to cook it longer since there was more of it, but it turned out good 🙂 It was cakey like other people have said, could have been from the gluten free flour, but we liked it. I found out that If you use egg whites the cookie will rise haha. But I seriously love this recipie. 10/10! I want one every day! Tastes amazing! I had to cook it for 1 minute… but the texture and taste are perfect! It doesn’t have an ‘eggy’ taste like other single-serving recipes. I love it! Absolutely delicious! This really hit the spot, even with using vegan butter. I loved the cake-like consistency, it was exactly what I was looking for. Thanks so much! Oh boy! Chocolate chip and ice cream are among my greatest weaknesses. It’s just so easy to make but I’ve been holding back because it’s so sinful. But anyway, last night we decided to let it all out and party as we watch the Superbowl! Guess what? Everyone has nothing but praise for my microwave mug cookies. All but thanks to you 🙂 5-star for you Jamieanne! Loved this! My only addition would be salt – when finished, sprinkle with sea salt (I’m a salty/sweet addict). Hah! I did this and it was DELICIOUS. Added 2 scoops of ice cream and drizzled choco syrup 😀 YUM! OH so delicious! I have absolutely HATED every microwave cake or dessert recipe I’ve tried. This was AMAZING. So quick and easy! I made the mistake of using self rising flour and no brown sugar. 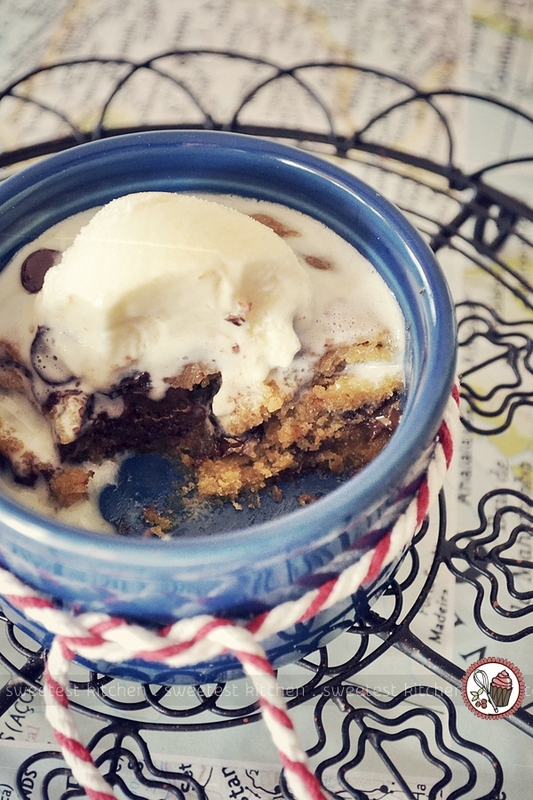 Basically, you showed me how to make my favorite dessert, molten chocolate lava cake. If you put all of the chocolate chips in the center and cook in a dome shaped bowl and flip upside down to serve, omg omg omg. Thanks. Now I have to hit the gym overtime. Not going to admit how many I made and ate o_O! i made this and it was sooo good! amazing recipe! I just made this and they were…edible. It was ok if ur reeally hungry nut, they are dry and cakey and could actullay feel the flour and some of the egg. I hope I get better luck next time. It’s okay.. needs baking soda though to make it a little more of a classic choc chip cookie taste. I tried this recipe, but I ended up having to use about 5-6 tbsp of plain flour to get a mixture similar to cookie dough. 3tbsp is simply too soft and resembles goo rather than cookie dough. When I use about 5.5 tbsp of flour and follow the rest of the recipe the way it is, it still tastes super great though!! does anyone know how much calorie this recipe makes? I made this with the kids I babysit as a quick and easy sweet and it was a hit!! thanks for making me the best babysitter ever!! Ive made this recipie a few times know and I always use two table spoons of white sugar Insted of one white and one brown. It still comes and delicious I think it’s better than a regular cookie. 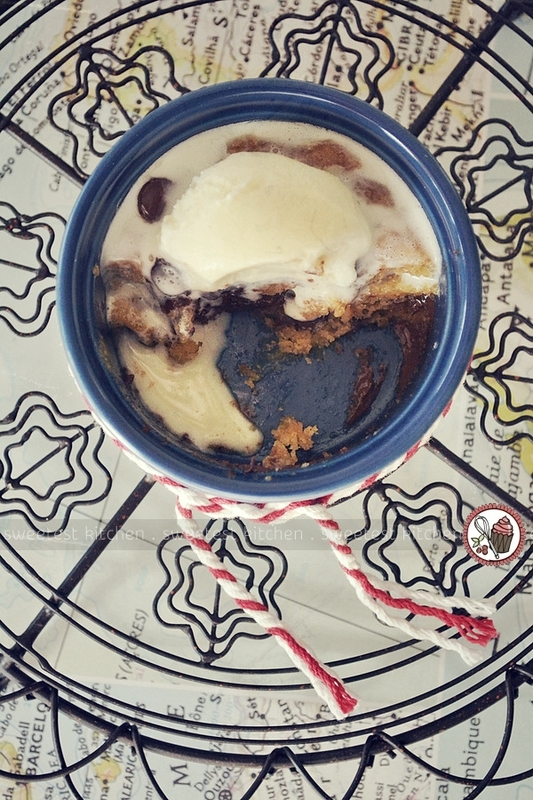 Using a 700 Watt microwave, it took full power and 40 seconds; was great with chocolate chip icecream on top. Just made this — amazing! I used regular sugar, and added a spoon of mint ice cream! Took 35 seconds in my microwave! This is delicious! So glad I found this recipe! I too am from Indiana 🙂 Thanks for sharing! You can, if you have nothing else. However, the larger sugar crystals may not dissolve fully, and you may find that the end result is a bit gritty. OMG! This recipie was SO easy and it tasted SO good. 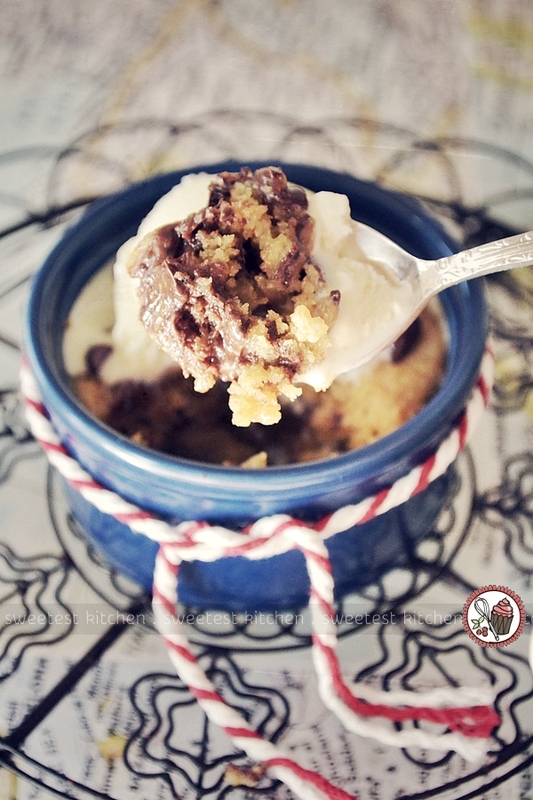 I have tried so many microwave cake, brownie and cookie recipies and so far this was THE BEST. For some reason my cookie puffed up a tiny bit and the cookie had a muffin-ish texture. Who cares though it still tasted AMAZING! A bit too sweet for me though. I’ll just add less sugar. It is more than 104 degrees F (40 degrees C) in my kitchen now– so I sure didn’t want to turn on the regular oven. This recipe made a yummy cookie in the microwave in just 30 seconds (after melting the butter for 15 seconds) so no need to make it any hotter in my house. Thanks for a fun treat! I was craving something a little naughty so I started googling and ended up here. I followed the recipe but used normal butter and left out the added salt and used chopped up dark chocolate… OH MY SWEET JESUS! I mean I was a little apprehensive at first because after microwaving it for the 40 seconds it was still a bit raw so I microwaved it another 20 seconds, still slightly raw… 20 seconds again under close watch and out came the mixture, less raw looking but still looking under done. I stuck my spoon in to test and it looked cooked… grabbed out my icecream and took my first bite all together… I didn’t stop for air until it was all gone. I’m one happy camper with a tummy full of love now! I really liked this! I was home alone and my parents told me not to use the oven/do anything dangerous, but I was having a sweet tooth, and this was my alternative. It’s a tasty recipe! I kinda just estimated the ingredients so it’s probably different than the actual recipe but I am still very happy with this. Thank you for sharing! So, if I made this, making sure to follow directions exactly, and it literally turned into a cake, what went wrong? As in, I put it in the microwave, and it rose and had the consistency of a cake. This is amazing! Instead of chocolate chips I used left over chunks of dark chocolate peanut butter cups. It was delish! I doubled the recipe and used a whole egg rather than just the egg yolk. I also added in way more chocolate chips (who wouldn’t!) and it tasted like heaven. 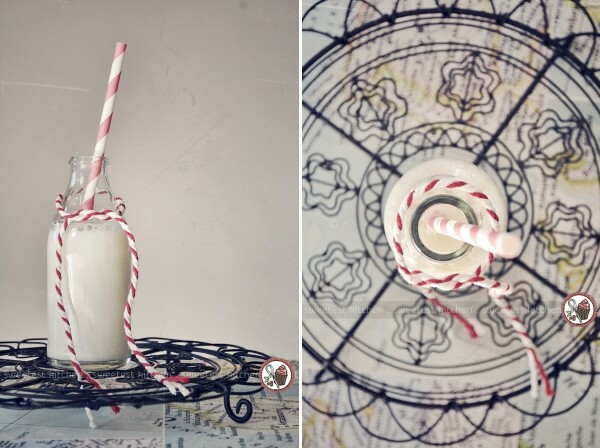 Thanks so much for posting this – will definitely be making it again! i tried to make this, but the cookie ended up being gooey and not a cookie 🙁 what do you think i did wrong? By far the best microwaved pudding I’ve ever made. I did a double choc version as suggested by one of the commenters above subbing half a tablespoon of flour with the cocoa. Also pinned it so I can find it again! this turns out more like a cake for me and it had a horrible eggy smell.. what am i doing wrong? tastes alright i guess- wont be making it again though. i followed the intructions to eye. I made this just now and it was quite tasty! The only problem was it tasted more cakey like than it did a gooey cookie. I’m not sure what went wrong lol, it rose more than I expected but I used plain flour! Swapped out the sugars and extract (unavailable on hand) for maple syrup and peanut butter. Doubled the recipe (because I’m a little piggy, lol), cooked for 70 seconds and it came out heavenly!. Such a great, easy and quick sweet tooth fix. Just totally cancelled out the 370 calories i burned on the elliptical! Quick answer to a cookie craving without the multiplied tempation of a couple dozen on the counter. Delish! Hi, thank you for sharing this recipe. I made it with a few substitutes and it still came out great. 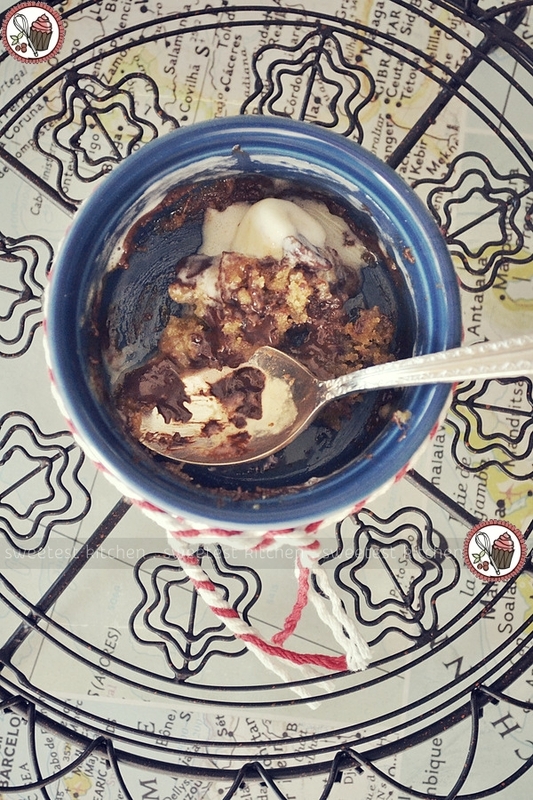 I used coconut and white sugar, pink himalayan salt, egg replacement, and carob mini chocolate chips; microwaved in a ramkin dish. The end result is pretty much as everyone elses, a cake-like chocolate chip cookie -soft, delicious and oh so yummy. I will say it definitely satisfied my sweet tooth. And, the calorie intake is less due to the egg replacement. P. S. I’m giving this recipe 5 stars eventhough I made a few substitutes, because in the end, it delivered well in consistency. It cooked just as planned, but personally, it was too sweet. Next time I may only use 1tbsp of chocolate chips and let it cool completely before digging in! Quick and easy chocolate fix! I’m pregnant and found myself craving a chocolate chip cookie at 2am. As most I didn’t want to bake an entire batch of cookies at that time of night. I found this recipe and have been hooked ever since. It’s super easy and fast so I’m able to satisfy my craving right away. And it is also DELICIOUS. I tried this with a friend, and we had these cute little heart shape cups but we didn’t know it was metal, so we put it in and the microwave lit up, so we took it out and put it in the oven for a few seconds, and it still tasted amazing! Going to do it again but with a microwave cup! I need to pay attention more! I’m not sure whether to hate you or love you- this was really, really good. And thanks to you, I taught myself the %70 power on my new microwave! Cooked as directed and it was perfect with Bob’s baking flour and just regular sugars- I’m going to try the peanut butter suggestion soon as well as to throw in some walnuts. OMNOM NOM I used self raising gluten free flour, so it came our rather cake like but still tasted amazing. I also used crushed dark chocolate, since I didn’t have any chips, and it still came out great! Tried many of these trying to find which is the best and this is far up there. Cooked mine for 30 secs and was well undercooked so I gave it an extra 30 in 10 second intervals and it cooked to perfection in 1 minute. I defiantly suggest this recipe! Sorry I have a question. What WATTage power is your microwave ?? Are microwave cookies supposed to have a texture like cookies or are they something on its own? For those who loved the recipe I’d love to know what kind of texture you got! Mine looked good, from the dough to after microwaving, but the texture is cakey, dense muffin like… no hint of crispiness or cookieness, which I expected from microwave cookies though!